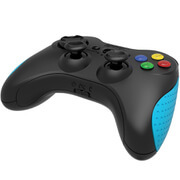 KontrolFreek UltraX is the convex version of our extremely popular KontrolFreek Ultra. The dimpled thumb pad provides an extremely even and consistent grip, giving you better medium to long-range accuracy. UltraX is the new standard for convex FPS Freeks. By increasing the length of the analog sticks slightly, precision is improved dramatically. UltraX provides a range of motion increase of over 40%, giving you the ability to make smaller, more precise in-game movements. This affords the luxury of turning up controller sensitivities to maximum levels so you can turn on your opponents faster and gain the upper-hand during intense gun battles. UltraX also gives you better control while requiring less force—alleviating thumb-fatigue—and providing more comfort to long gaming sessions. In short, this increased precision and decreased thumb-fatigue results in a better way to game.